Release of 2017 HCM Data Quadrant Awards highlights best enterprise software as selected by business and IT professionals. Software Reviews, a division of world-class research and advisory firm Info-Tech Research Group Inc., published the 2017 HCM Data Quadrant Awards and Report today. 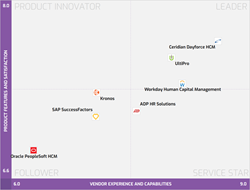 The report identifies three leaders in the HCM software space: Ceridian Dayforce HCM, UltiPro, and Workday Human Capital Management. These three offerings emerged as the overall market leaders based on the detailed feedback of 676 reviews from experienced HCM reviewers.